Now that it appears our two consecutive weeks of rain may have ended, growers who did not sustain devastating damage from Hurricane Michael will continue harvesting after the ground dries out a bit. This kind of rain has not likely been helpful to the quality of the nuts still on the ground. 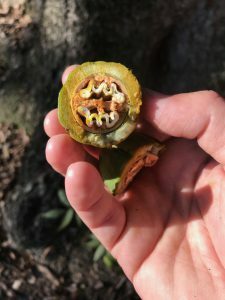 Nuts remaining in the trees should be less affected. 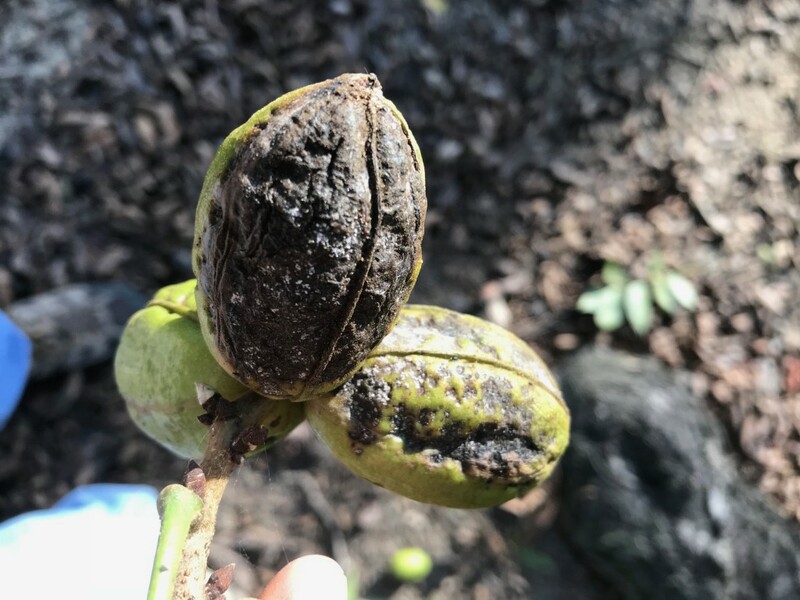 Many growers in the Southwestern part of the state are not harvesting as a result of damage inflicted to the nuts in the extensive cleanup process and are forced to rely on crop insurance to help them get through the loss. 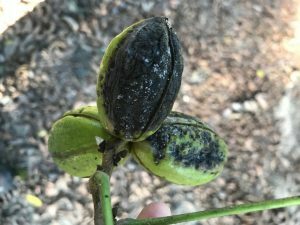 In many parts of the state, but especially in east Georgia or in orchards with sandier soils, we have seen much of the crop lost to a problem in which the shucks began turning black and in many cases the nuts fell from the tree. Most of these nuts have very poorly filled or rotted kernels. This is something we began seeing prior to the storm. This has been most common on Stuart but has been observed on other varieties as well. This likely is a result of many of these trees bearing a heavy crop throughout the growing season. Throughout the summer we had a lot of rain. Pecan trees have very large root systems that extend outside the irrigated zone in the orchard. When we were getting rain all summer those roots outside the irrigated zone were getting plenty of water because the soil moisture stayed pretty consistent. This allowed the trees to carry a heavier crop than normal through the season. When it turned off hot and dry in September those roots outside the irrigated zone no longer could get the water they had grown accustomed to and needed with the heavy crop load. As a result the tree became stressed and could not finish out the nuts. We have isolated Phomopsis, an opportunistic fungal pathogen from these nuts, but while the fungus may be accelerating the problem, the tree is made susceptible to the fungus by the stress generated from a combination of crop load and late season drought and heat. Short of crop thinning in July/August there is nothing growers could do about this problem. 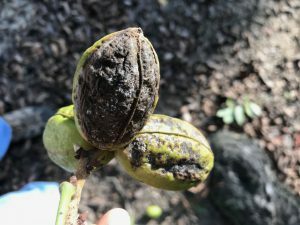 This problem has severely reduced the crop in the eastern part of Georgia, further reducing an already highly storm-limited crop for the state. As a result I will be surprised if Georgia produces 50 million lbs this year.